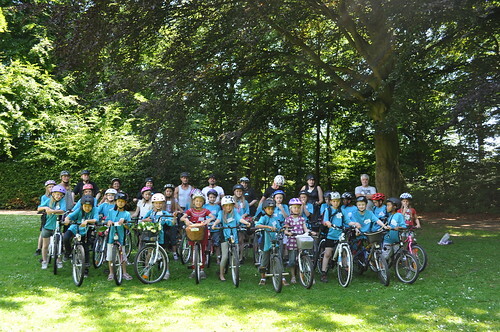 This summer, the City of Odense staged its first cycle summer school. And it is safe to say it won’t be the last! The idea came about because the number of children who bike to school has dropped in recent years. When students are driven to school, it creates chaos and potentially dangerous situations in front of the school, which in turn makes parents afraid to let their children bike to school. Gradually, this creates a vicious spiral that not only influences traffic safety around the schools, but also has a negative effect on the children’s well being, their learning ability, their motor skills, and more. But if parents do not teach their children to cycle, who will? Odense tried a different approach. Why a cycle summer school? The week-long cycle summer school was to be an alternative to soccer camp, swim camp, or other popular summer activities. Attendance was obligatory, and students had to be at school from 9 AM to 3 PM. The week was full of fun activities to make it attractive to the children, but at the same time the option of full-day childcare made it a good offer to the working parents. The first day saw a visit by a bicycle mechanic who not only checked the children’s bikes and helmets but also installed cycle computers on all bikes. By the end of the week, the cycle computer was evidence of a busy week: all children had biked more than 100 km – significantly more than expected. The cycle computer turned it into a sport to see who could cycle the most, and breaks during the day were often used to bike more kilometres! The week was based on the concept of cycling games developed by the Danish Cyclists’ Federation that consisted of a list of familiar children’s games converted into cycling games. They all have in common that the child has to focus on something other than cycling, while cycling. And by learning this, the child becomes a more secure cyclist when out in traffic. 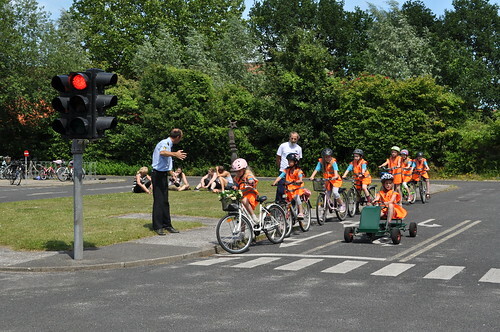 In addition, the children went on a number of excursions to practice and test their skills in traffic. They biked into the city to see a mime play, to a playground, to a bicycle playground, to traffic school, and they went orienteering in the woods. The children didn’t stop to think of the bike ride, as they were simply thinking of the activity they were going to. During the week, the children grew increasingly better at keeping their balance, breaking, and listening to the adults while they were out in traffic. But the cycle summer school had a positive effect on more than the students’ cycle skills. One boy who, according to his parents had been very inactive, was now impossible to get off his bike, and he had even joined the other kids playing soccer on the street where he lived. What was especially interesting, however, was the reaction of the adults at the cycle summer school. Initially, being responsible for children aged 8-10 in traffic had caused concern. But already on day four, everyone was comfortable enough to bike with the children along the most heavily trafficked street in Odense. By the end of the week, insecurity had changed to a firm belief that it is indeed possible to bike with students in primary school. 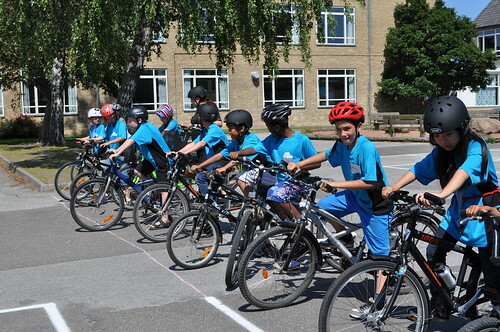 The success of the cycle summer school will definitely be repeated next year, and the city of Odense will offer to arrange cycling games at the schools so the adults can come to feel safe taking even the younger students cycling.